Light in the Storm » Blog Archiv » April outlook – will the warmth continue? April outlook – will the warmth continue? March has entered the record books as the second warmest March on record in NYC, after the warmest February on record, second warmest winter (DJF) on record, and warmest DJFM period on record. Truth be told, it’s been about as mild as it can get in our area for the cool season. Since November, we’ve seen countless days in the 50s and 60s, with very few days featuring sub freezing or even below normal temperatures. The growing season is off to a remarkably early start, about 3-4 weeks ahead of schedule for most in the tristate area, thanks to the record warmth of recent months. But this can’t last forever, or can it? Looking ahead into April, it’s safe to say we can close the books on the winter 2011-12 dismal snowfall season for NYC and the coast, barring a freak mid/late spring storm (chances for that happening are slim to none). The weak/moderate La Nina is finally weakening, as evidenced by recent Southern Oscillation Index (SOI) values. When the index is in a predominately positive state, it indicates enhanced tropical easterly trade winds, more upwelling to the west of South America, and cooler waters (hence La Nina). When the SOI is in a negative state, generally we see weakened easterly trade winds, which allow the warm water in the west Pacific to gradually slide eastward and pile up (the development of an El Nino). The latter is what should occur over the next several months. Statistical and dynamic models are in fairly good consensus that we’ll reach warm neutral, potentially weak El Nino status, sometime this summer. Daily SOI values have been in the tank lately, with readings as low as -26 to -28. This means the environment is becoming rapidly less favorable for the maintenance of the La Nina. Atmospheric angular momentum (AAM) is another good way to measure ENSO state, and unlike the SOI, when the AAM is in a positive state, it generally means the atmosphere is more El Nino-like. Over the past few months we’ve seen a predominately negative AAM, but over the past couple weeks, values have surged to near neutral. This is yet another indication of the dying La Nina. A third factor to examine is the most obvious one — sea surface temperature anomalies (SSTA). Tropical Pacific SST’s have warmed quite significantly since late winter, and crucial ENSO region 3.4 is nearing neutral — now at -0.22c as of the latest weekly update. This suggests a cold neutral ENSO regime currently, a major rebound from the values down around moderate La Nina criteria a couple months ago. These SST’s will continue to warm, slowly but surely, over the coming weeks and months. So what will April have in store? 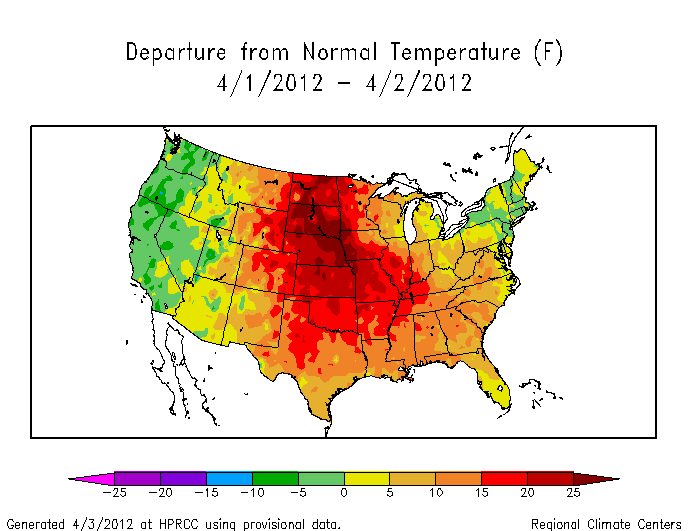 Here’s what the US looks like temp wise in the first three days of the month. Note a continuation of the big heat in the Mid-west, and a touch of coolness on the West and East Coasts. 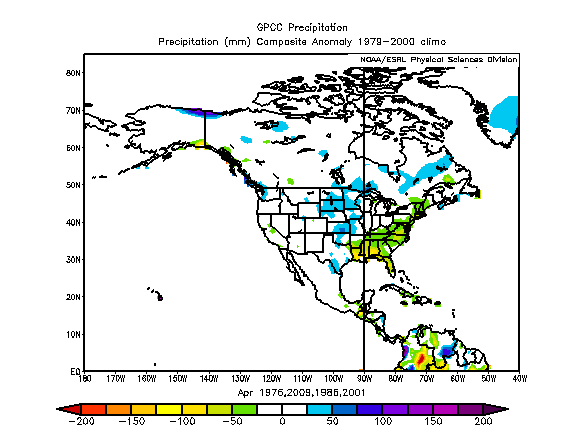 While I don’t expect the month of April to finish with temperature departures as warm as they are right now in the Central US, I am anticipating another fairly warm month nationwide, with the West Coast and New England likely being the coolest spots. ENSO region 3.4 will be near neutral in the .weeks, and looking at the other important teleconnections, both AO and PNA values should bounce around near 0 / slightly positive, while the NAO is the most negative its been since last October. However, the NAO should not tank significantly negative, and may actually rebound to neutral to slightly above by late April. What all this means is the atmosphere should be in a state that does not support the maintenance of well below normal temperature regimes or well above normal temp regimes. Rather, temperatures in the Northeast should average out close to normal in the next couple weeks. Easter week (4/8 – 4/14) may end up slightly cooler than normal in the Northeast as a storm cuts off near Newfoundland, keeping mid levels rather chilly into the middle of the month. However, thereafter, that chilly pattern should breakdown even in the Northeast, giving way to more warm shots by the final 10 days of April. I’m most confident about the region from the Rockies to the Ohio Valley (most of the country) finishing warmer than normal for April. I’m a bit less confident but still believe the Northeastern part of the United States should end up warmer than normal for April, and also drier than average. 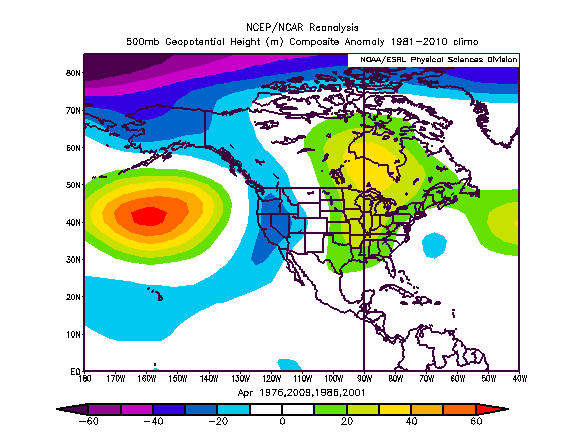 Given the expected ENSO and teleconnection pattern, I came up with 4 analogs for the next month: 1976, 1986, 2001, and 2009. All of them were warm from the Rockies to the Northeast coast, with a cool pattern on the West Coast. 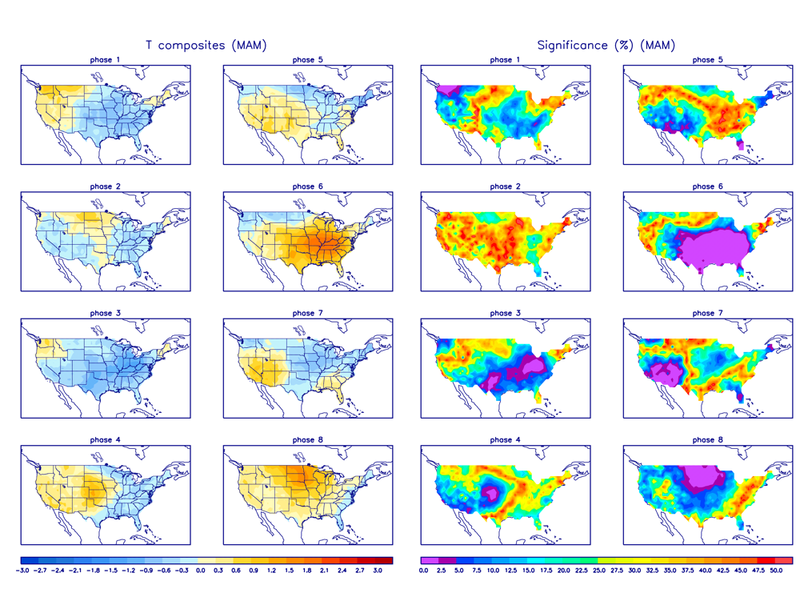 All of them had less precipitation than normal in the Eastern US, with a precip maximum in the central Plains. Now that we’re near neutral ENSO, the MJO will have a greater influence on our pattern (it has had a significant influence this past winter). Tropical forcing can be helpful in determining mid latitude ridge/trough position and general temp/precip patterns. MJO will be swinging through phase 8 and phase 1 in the next couple weeks, which is a cool signal in the East. Thereafter, things become less certain, but MJO may enter the circle of death. As noted earlier, the cool period for Easter week seems reasonable, with warming temps thereafter. MJO phase 1 map for the US in April — note the coolness in the East, but it should not be as impressive or expansive as this. 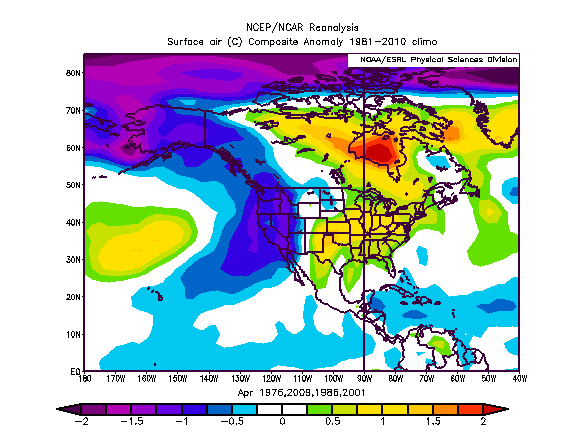 — Final temperature departures for April should be slightly above normal in the Northeast, but not as warm relative to averages as the past several motnhs (i.e., closer to “normal” than the past 4 months).